Great tactile hands-on brain game for students of all ages. 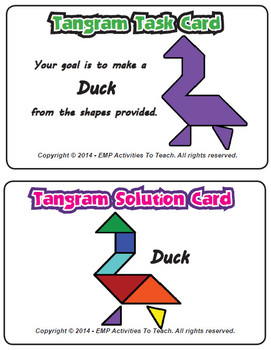 Prefect for teaching problem solving, team work, spatial thinking, geometrical shapes for math, and more. 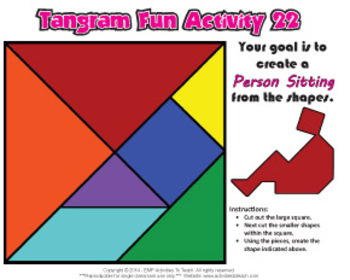 Tangrams are a dissection puzzle consisting of seven flat shapes which can be "put together" to form people, building, animals, and geometric shapes. 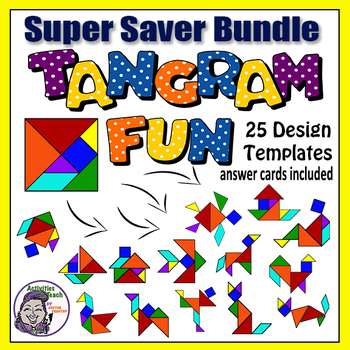 This super saver bundle contains: 24 tangram puzzles sheets with a 5 inch tangram and a puzzle goal (each sheet has a different shape goal), 24 tangram task cards, 24 solution cards, and a large 8 inch puzzle. 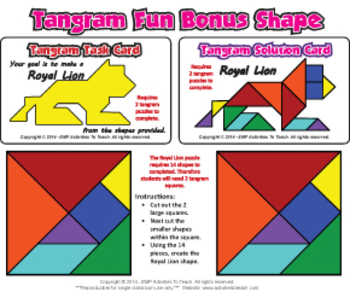 PLUS a BONUS 25th Double Tangram Royal Lion Puzzle. Puzzle Shapes included: Dog, Sitting Cat, Sitting Fox, Standing Fox, Camel, Chicken, Scalleywag, Bird, Rabbit, Duck, Swan, Goldfish, Tropical Fish, Beta Fish, Lion, Turtle, Sailboat, Houseboat, Classic Boat, House, Rocket Ship, Person Sitting, Person Dancing, and Person Skating.